How Democratic is the U.S. Senate? Today’s CONVO focuses on the U.S. Senate. Democracy is based on the proposition that all people are created equal and deserve the same political rights. But does the U.S. Senate deliver on the democratic promise? Today’s CONVO is about how democratic the U.S. Senate is and what we should do about that. Join our CONVO to learn, discuss and act on this critical issue. Here’s how CONVO works. How democratic is the U.S. Senate, and what should we do about that? Should other factors besides democracy be considered when constructing a political system? Did the Framers value democracy and if so, why didn’t they use the word in the Constitution? Was the Senate set up to be democratic in the first place? Who does the current composition of the Senate most benefit and whom does it most hurt? What would be the best way to change the Senate to make it more democratic? Would it be Constitutional to alter the Senate? 1-Why was the Senate even created, anyway? 1-Zaten Senato neden yaratıldı? 2-And how democratic is our entire political system either? 2-Siyasi sistemimiz ne kadar demokratiktir? 3-Why the heck are you translating into Turkish? 3-Neden halt türkçeye çeviri yapıyorsunuz? 4- Do you really think this is funny, troll! 4- Bunun gerçekten komik olduğunu düşünüyor musunuz, troll! Is the U.S. Senate democratic? Use your brain to learn all about today’s critical issue with these facts, data, maps, charts, visuals, videos, and more. The United States did not always have a bicameral legislature (two chambers: the House and the Senate) Initially, the Founding Fathers, or “framers” of the U.S. Constitution, drafted a document called the Articles of Confederation, which was written in 1777 and ratified in 1781. The Articles established a unicameral Congress and the Supreme Court, but no Office of the President. What the what!?! This original Congress was made up of members elected by each of the states, which were represented equally. Thus small states like Delaware had the same representation as large states like New York. Way? Way! Undecided, at the Philadelphia Convention was how the Congress would be composed (unicameral, bicameral) and how it would be apportioned (based on the population, or simple the same for each state). Small states like Rhode Island feared they would be overwhelmed by the voting power of large states like Virginia, and demanded a Senate in return for ratification. The small states essentially held the Constituiton hostage over their demand for equal representation for all states (not people). This seems very undemocratic, at the same time, had the Senate not been added to the Constitution, we would not have a United States of America. You can read more about the history of the U.S. Senate. The Senate was not created to be democratic -quite the opposite; and this undemocratic legacy remains with us today. The U.S. Constitution created the United States Senate with equal representation — two senators — from each of the country’s states, despite the wide variation in population from state to state. Fair or not, throughout the country’s history the Senate typically passed legislation, nominations, and other matters with broad support. Most votes passed with around 68% of senators voting yes, with those senators representing about 68% of the U.S. population. If the allotment of senators was unfair in principle, it seems to have been fair in practice. But 2017 was an unprecedented year. In 2017, for the first time, the Senate’s decisions were often made by a coalition of states representing less than half of the country’s population. The median share of senators supporting passed bills, confirmed judges and agency leaders, and other matters dropped to 58% (the lowest since 1930), with those senators representing just 49.5% of the U.S. population (the lowest ever)! The 17th Amendment made the Senate more democratic by allowing for the direct election of Senators by the people of each state. A voter in Wyoming enjoys roughly 70 times more influence in the Senate as a voter in California, which sounds like the most unfair statistic in American politics, until you remember that taxpaying U.S. citizens in Washington, D.C. and Puerto Rico still have no influence in the Senate at all. When the Constitution was first adopted, the largest state had fewer than 10 times the voters per senator as the smallest; now, that ratio is 72. A slight majority of Americans live in just nine states. They have 18 votes in the Senate, while the minority holds 82 seats. More to the point, it would be very strange indeed if there weren't a gap between Senate vote shares and seat shares. The Senate was purposefully set up as an anti-democratic institution meant to privilege the voices of Connecticut residents above those in, say, New York. That was what small states' representatives demanded at the Constitutional Convention in 1787, and it's what they got, over the opposition of those like Alexander Hamilton and James Madison who thought that giving each state the same number of votes was hideously unfair. Moreover, until 1913, the Senate wasn't even popularly elected. Every idea of proportion and every rule of fair representation conspire to condemn a principle, which gives to Rhode Island an equal weight in the scale of power with Massachusetts, or Connecticut, or New York; and to Delaware an equal voice in the national deliberations with Pennsylvania, or Virginia, or North Carolina. Its operation contradicts the fundamental maxim of republican government, which requires that the sense of the majority should prevail. Sophistry may reply, that sovereigns are equal, and that a majority of the votes of the States will be a majority of confederated America. But this kind of logical legerdemain will never counteract the plain suggestions of justice and common-sense. It may happen that this majority of States is a small minority of the people of America; and two thirds of the people of America could not long be persuaded, upon the credit of artificial distinctions and syllogistic subtleties, to submit their interests to the management and disposal of one third. 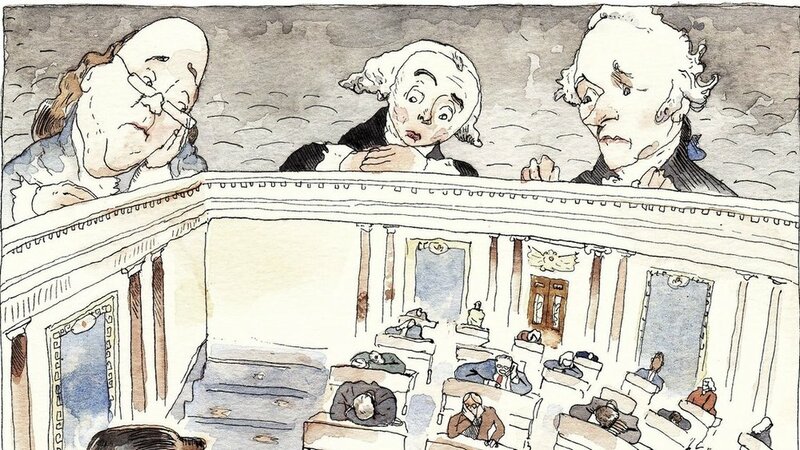 Hamilton hated—hated—the compromise under which the Constitutional Convention was blackmailed into giving every state the same number of senators regardless of population. In the essay quoted above, he is ostensibly railing against the Articles of Confederation. Obviously, though, his argument would apply with equal force to Article I, Section 3 of the Constitution that he, James Madison, and John Jay were madly scribbling in defense of. Check out the Convo Forum Template to get an idea of how this works. Then open the Convo Forum Senate, make a copy for each of your classes, then have your students fill in their class forum. Liberals who complain that the Senate is undemocratic are really just whining about California - By Jonah Goldberg on October 16, 2018 in the LA Times. Use Your Ears and Join us as we Listen and Discuss today’s critical issue. Students discuss the topic in a setting that maximizes listening. Students write a post-discussion Editorial about the topic to persuade the reader of their position. 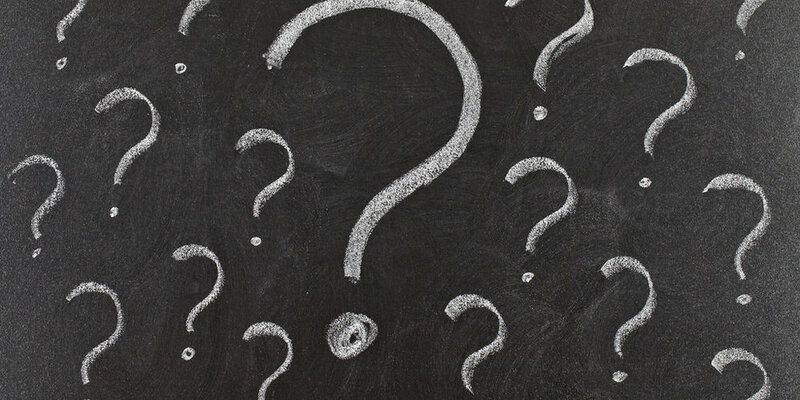 Students must use and name at least one source from the forum in their editorial. Students act on what they have learned about the topic. Students can work alone or in teams to turn their learning into action. Here is a list of Critical Actions students can take. Today’s critical issue CONVO is the Border Wall. President Donald J. Trump wants to build a southern border wall between the United States and Mexico. Democratic leaders in Congress are opposed to his plan. 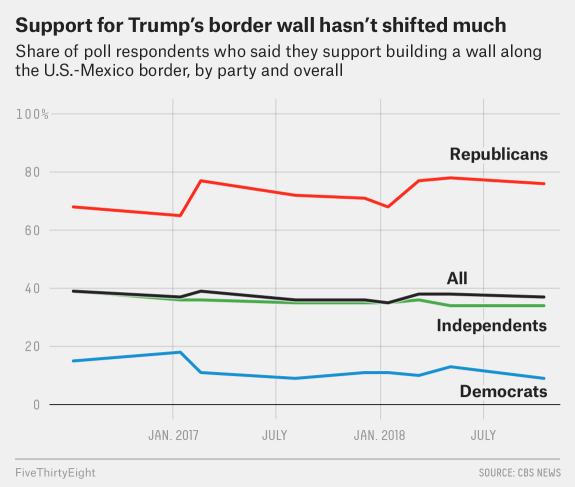 Americans are divided in their support for a southern border wall. Join in our CONVO to learn, discuss and act on this critical issue. Here’s how CONVO works. Should the U.S. government build a border wall between the United States and Mexico? Why should we build a southern border wall? Do you think the border wall will be built? Do you support a Southern border wall? Should a land of immigrants build a border wall to stop immigrants? Is a wall the best way to stop immigrants? Should we build a northern border wall between the U.S. and Canada? Most immigrants illegally in the United States have overstayed their visa. Will a southern border wall affect the largest group of people in the United States illegally? What is the history of other famous border walls throughout history? What would the framers think about a border wall? How would a border wall impact your life? If the goal is to decrease illegal immigration, is a border wall the best way to achieve this goal? 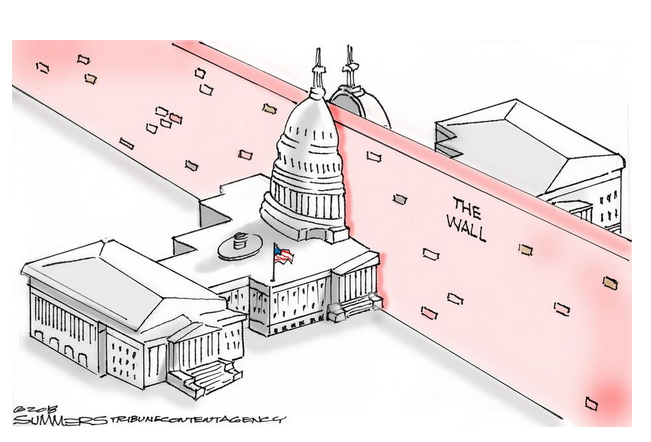 1-How much would a wall cost? 1-O le a le tele o le tau o le pa? 2-What impact would the wall have on commerce and trade? 2-O le a le aafiaga o le puipui i luga o fefaatauaiga ma fefaatauaiga? 3-How might liberal and conservative media cover the wall differently? 3-E mafai faapefea e le aufaasālalau agavaʻa ma le le mautonu ona ufiufi le puipui? 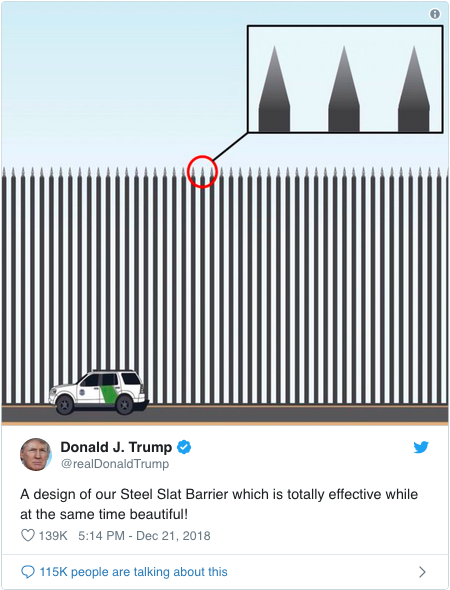 4-Do you think this border wall is a smart idea? 4-E te manatu o le puipui puipui o se manatu atamai? immigrants from crossing over when they are just gonna keep coming? tagata malaga mai le sopoia o le taimi o le a latou o mai pea? 6-Are illegal immigrants bad for America? 6- E le lelei tagata ulufale mai le tulafono mo Amerika? 7-Should we build a border wall between Canada & USA to make it fair? 7- E tatau ona tatou fausia se puipui tuaoi i le va o Kanata ma US ina ia talafeagai? 8- How do we know the wall will even work? 8- E faʻapefea ona tatou iloa o le a galue le puipui? Is it worth spending all this $ on something that might not even work? E aoga le faʻaaluina o nei tupe uma i luga o se mea atonu e le aoga? 9- Where is the money gonna come from? 9- O fea e sau ai le tupe? Americans share approximately 2,000 miles of border with Mexico. That long stretch includes the Rio Grande, which accounts for approximately 1,255 miles of the border between the two countries. The Colorado River makes up an additional 534 miles, and the rest of the border is comprised mainly of mountain ranges and the Chihuahuan and Sonoran deserts. There are 52 crossings between the two countries, including eight rail lines, 24 bridges, two dams, 17 roads and one ferry, according to a report from the Border Policy Research Institute at Western Washington University. The BBC reports on the Border Wall. Here are some great NY Times Interactive Maps and Graphics about the border. 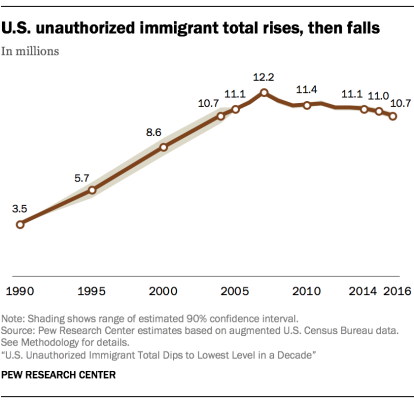 Here is a comprehensive look at immigration in the United States from the Pew Research Center. Listen to these fantastic podcasts about the border from The Daily from January 2019. How does the Government build a wall? Because of separation of powers, both the executive branch and legislative branch are involved in funding the government, making laws, and executing the laws.. For a wall to be built, Congress would need to appropriate funding and and the President would need to carry out the building of any border wall. Check out Article I, Section 7 below. Why the Wall Won’t Work - By David Bier inn the May 2017 issue of Reason. As of 1/16/19 the federal government is still partially shutdown, which means that ,many parts of the government (national parks, NASA, and others) are temporarily closed. This is now the longest government shutdown in American history. Are frequent government shutdowns a sign that our political system is not working? Why are we currently having a government shutdown? 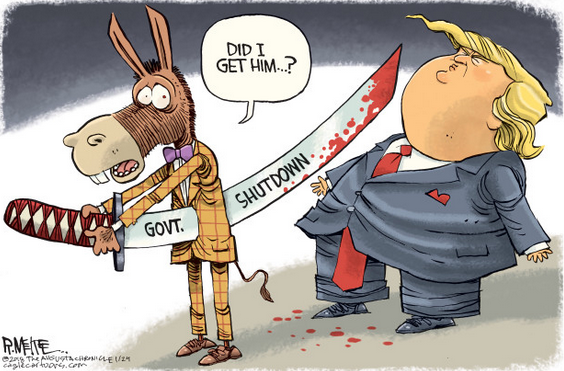 Who is to blame for the current shutdown? When will the current shutdown end? Will we have more shutdowns in the near future? Have government shutdowns happened frequently throughout American history? 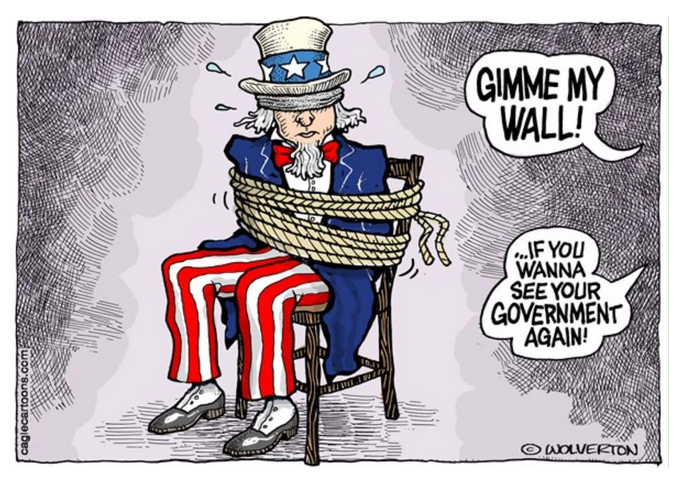 Are government shutdowns simply a product of separation of powers and checks and balances? What would the Framers think about the increasing frequency of government shutdowns? How has this shutdown impacted you? What is this shutdown thing? Ano ito shutdown bagay? How will this impact my school? Kung paano ang epekto na ito sa aking paaralan? why are we having a government shutdown? bakit kami ay masasansala ang pagkakaroon ng isang government shutdown? Exactly what it sounds like. 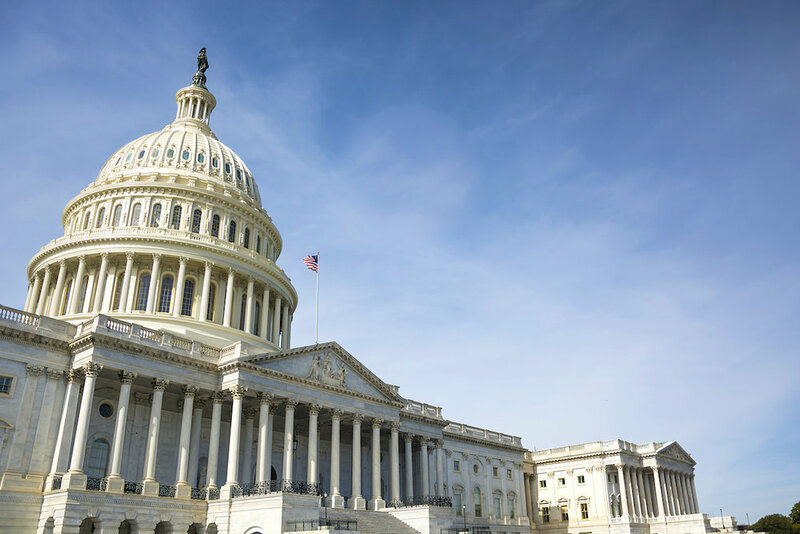 Much of the federal government gets its funding from annual budget appropriations decided by Congress. The majority of the government has had such funding in place since the current budget year began last Oct. 1, but other agencies had been operating on a series of temporary extensions, the last of which expired Dec. 21 at midnight. Since funding wasn’t enacted for those agencies, they were partially shut down. Some of the employees working at those agencies have stayed on the job nonetheless, while others have been furloughed. In both cases, they will be unpaid until spending authority is restored. Most governments (local, state, and international), businesses and organizations do not act by shutting down until competing factions within them get what they want. The U.S. Government does. Here are some unexpected ways the government shutdown might affect you. And here are the ways a government can cost more to shut down than to leave open! Federal government shutdowns have been more frequent in recent years. The federal government has been fully or partially closed three times since President Trump took office, and was also shuttered during the Obama administration. Even if the current shutdown is temporarily resolved, it is likely that there will be more shutdowns. This is not the first time this has happened, but it’s happening more frequently in recent years. And the government shutdown is affecting lots of people. Because of separation of powers, both the executive branch and legislative branch are involved in funding the government. Disagreements can lead to government shutdowns, even in years where there is not divided government like in 2018.Check out Article I, Section 7 below. YouGov asked about the shutdown for the Economist on Dec. 23-25. Fifty-one percent of respondents said Trump deserves “a lot” of blame, 44 percent thought congressional Democrats did and 39 percent said congressional Republicans did. But when asked who was most to blame, 46 percent said Trump, 35 percent said congressional Democrats and 6 percent said congressional Republicans. Reuters/Ipsos found that 47 percent of Americans said the shutdown was on Trump, while 33 percent said congressional Democrats were at fault. The poll was in the field Dec. 21-25. 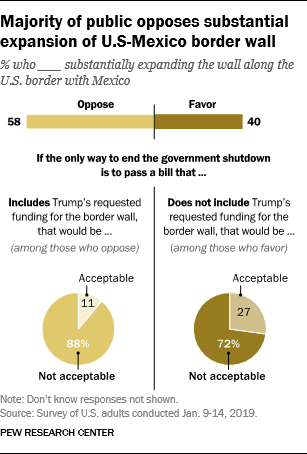 Likewise, 43 percent of respondents to a Dec. 21-23 survey by Morning Consult blamed Trump for the shutdown. Thirty-one percent thought congressional Democrats were responsible, and just 7 percent pointed to congressional Republicans. Practice what you’ve learned about the federal government shutdown with out Government Shutdown Worksheet. Now join us for CONVO where we will research, share, discuss, write, and act on your opinion on today’s critical issue. President Trump has nominated Judge Brett Kavanaugh to the United States Supreme Court. The Senate Judiciary committee will continue to hear testimony about Judge Kavanaugh and decide whether to recommend him to the full senate for a vote on his lifetime appointment to the highest court in the land. In This era of extreme partisan division in the public and on the Supreme Court, should Supreme Court justices be appointed for life? Should Congress have term limits? Should Brett Kavanaugh be confirmed to the Supreme Court? Would we be having a huge national argument about Brett Kavanaugh if we were talking about a 12 or 15 year term in office, as opposed to a lifetime appointment (which could easily last another 30 years - until 2048)? What does this national debate about the accusations against Kavanaugh tell us about divisions in the United States? Do you have friends who disagree with you about this issue? Do you believe the accusations against Brett Kavanaugh? in 1991 Anita Hill accused Supreme Court Justice Clarence Thomas of sexual harassment. He was confirmed to the court. Fast forward 27 years and two women have accused nominee Brett Kavanaugh of sexual harassment. How much have things changed since 1991? 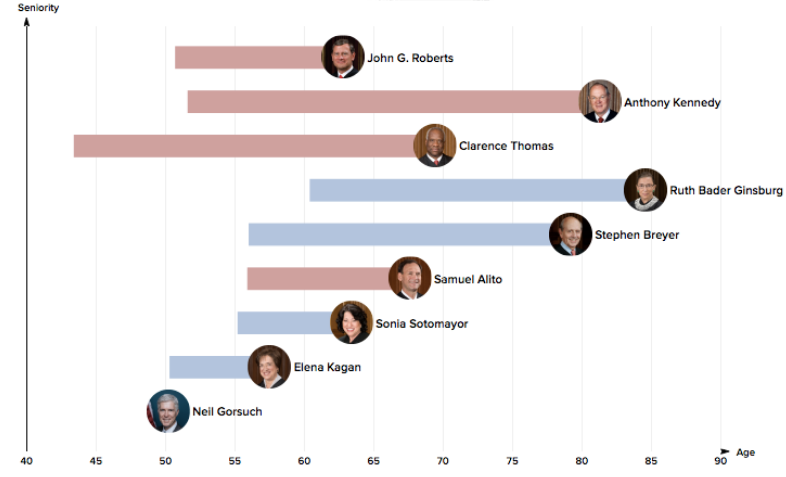 Unlike every other democracy in the world, the US has lifetime appointments for the Supreme Court. This means that whoever gets appointed could serve for 30 or more years — a tenure that is becoming more and more the norm. Here’s what the United States Constitution says about it. Supreme Court justices are nominated by the President of the United States and confirmed by the United States Senate. Here’s what the United States Constitution says about it. In Federalist No. 78, Alexander Hamilton (the Ten Dollar, Founding Father, Without a Father) explained why Supreme Court Justices should have lifetime appointments. 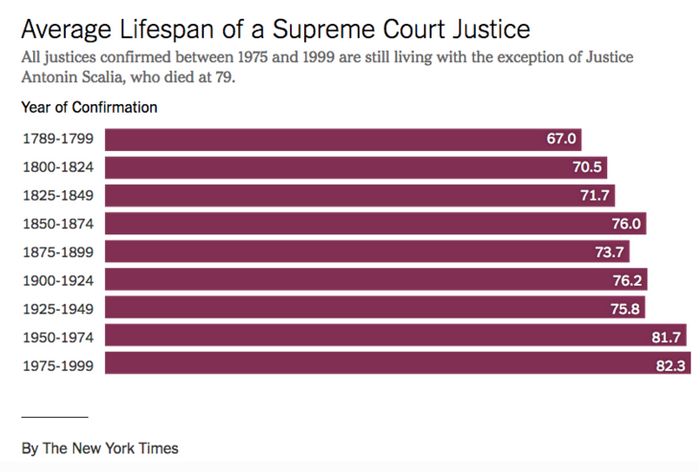 Read this NY Times Upshot article about why Supreme Court Justices are serving longer than ever. The majority of Americans agree that term limits for federal judges should be enacted, but setting a such a limit would take an act of Congress. A Reuters poll last year found widespread support for term limits. Sixty-six percent of Democrats and 74 percent of Republicans wanted 10-year terms for justices, and 80 percent of those identified with the Tea Party–supported term limits. And according to Lin Manuel Miranda, here’s what Alexander Hamilton and George Washington thought about term limits (although in this case, it was about POTUS not SCOTUS). Practice what you’ve learned about Supreme Court Life Sentences (I mean, terms) with our charts, questions, class starters, and POV scramble on our SCOTUS Lifetime Appointment Practice Worksheet. 100 pennies per team (ask the kids to bring in 33 pennies each). You will use the pennies all year. Fun Fact; Did you know that it costs about 1.5 cents to make 1 penny? Post-it-notes (5 per team) You could ask them to bring these in, too. How much does the U.S. spend on foreign aid and how much should it spend? 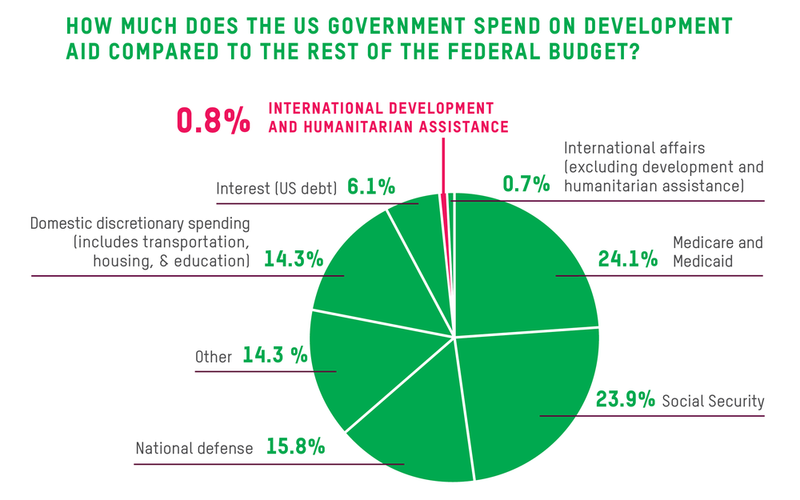 What portion of the US budget (the money our federal government spends each year) is spent on foreign aid? While you think of your answer let me say hi, welcome to GoPo Pro. Seat backs and tray tables should be in their upright and locked position prior to takeoff because today we’re going to learn all about the American political system. And as we go on our magical learning adventure, please keep in mind: 37% of all statistics are made up on the spot! 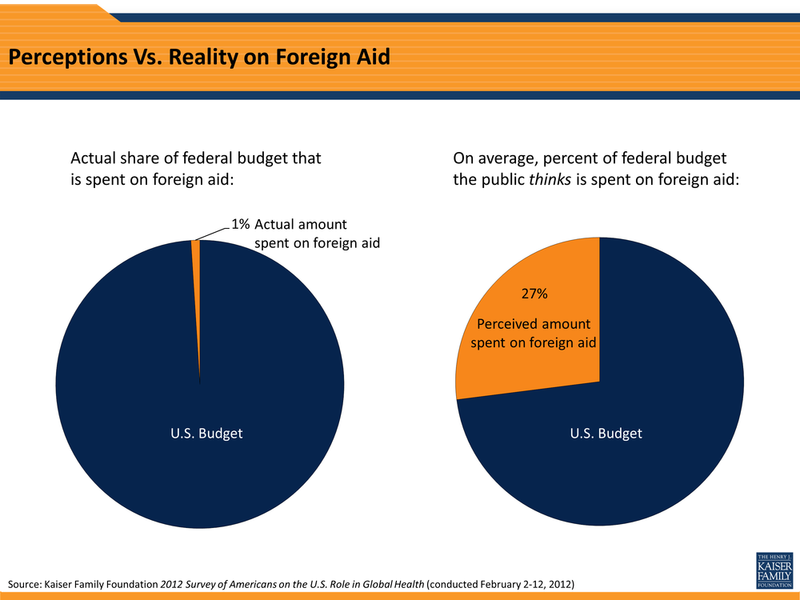 So back to the question: What portion of the US budget is spent on foreign aid? Or more than 100% - wait! And here’s one more question. Which of the following best describes your opinion of how much the US spends on foreign aid? By the way. Just to put this whole conversation in perspective. The federal budget is REALLY big. Last year, in Fiscal Year 2016 the U.S. federal government spent over 4,1 trillion dollars. That’s right. I said: $4.1 trillion. 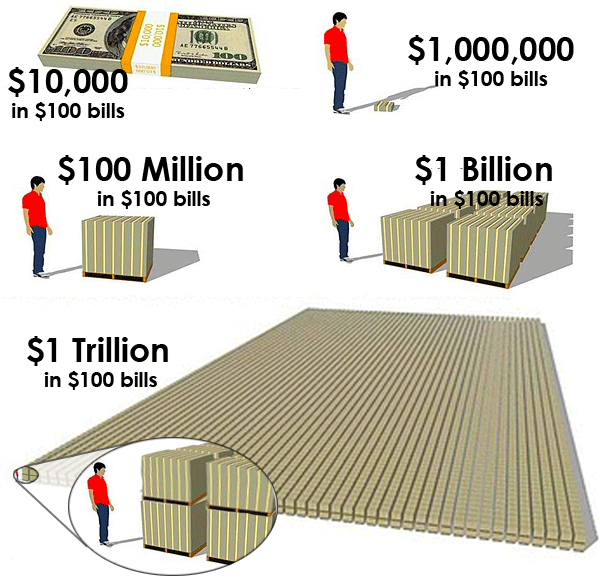 $4.1 trillion looks like this: 4,100,000,000,000 dollars. Which is the same as 4 thousand billion dollars plus 100 billion dollars. If you really want to understand the magnitude of a number that large, check out this visualization. That guy in red, by the way, should be cheering, not just standing there all slouchy. Now multiply the amount from that image 4 times and you’re almost to the amount the US government spent last year. DANG JUDY! Or let’s visualize it another way. Imagine a pizza cost 10 dollars! With 4.1 trillion dollars you could buy 410 billion pizzas. 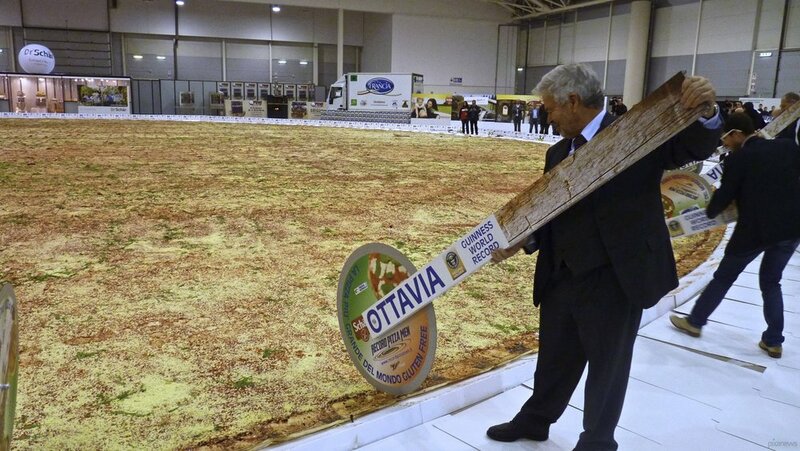 Or, even better, you could buy one GINORMOUS PIZZA! Back to work. Let's get to visualizing the US budget. It’s penny time! You can play along at home. Get out 100 pennies. If you don’t happen to have 100 pennies with you, get a job, slacker! Now, if you can't round up 100 pennies you can use 100 beans (dry please! ), 100 scraps of paper, 100 flip phones, or really just about anything that comes in hundreds and you can get your grubby little hands on. I’m going to use pennies because that’s how I roll. Gangsta Teacher be like, that's how I roll! In our budget simulation, each penny will equal 1 percent of the US budget. That means that each penny is worth approximately $41 billion. I want one. Now, get out a piece of paper. 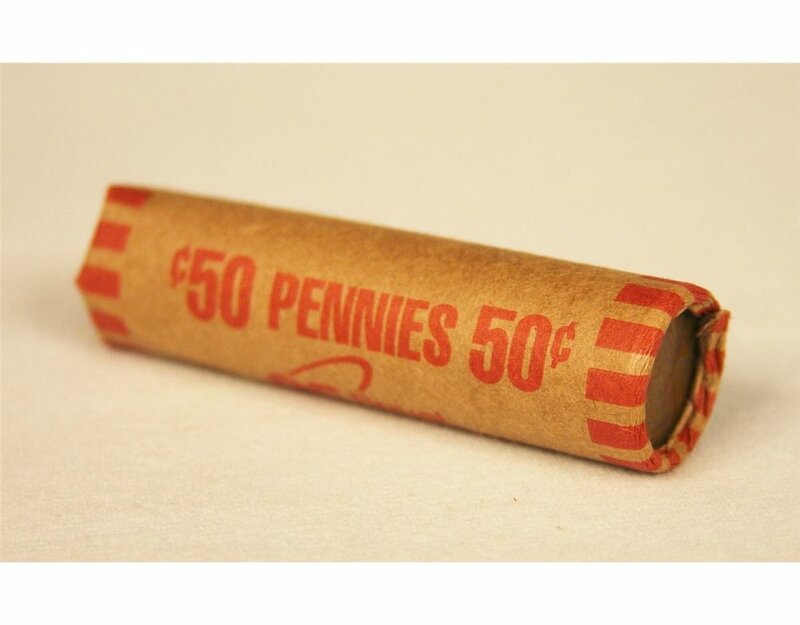 We need to put those pennies (or whatever 100 stupid things you have) into a circle on the paper. Arrange the pennies in a circle on the middle of the paper. Spread the pennies out so that they are touching but not overlapping each other. Pro Tip: one of your more anxious classmates will probably try to turn all the pennies facing the same direction - heads or tails up. Don’t say anything, but when they aren't looking, flip one of the pennies the opposite way-up, and see what they do. Repeat. Now draw a circle around the edge of the pennies. Remove the pennies. Try not to spend them all in one place. Now before we get to the main event - foreign aid expenditures - let’s practice with our pennies on something else. Imagine the circle represents all the money the US government spends each year (the budget). 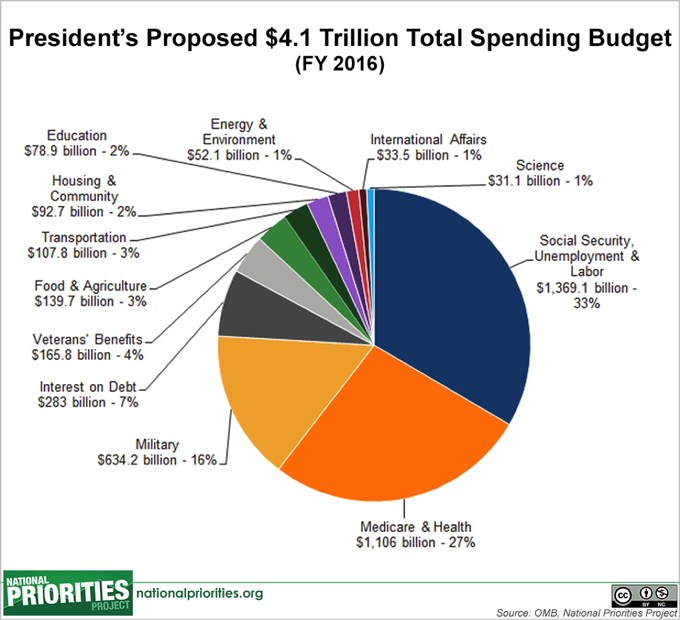 Anybody know the biggest single expenditure in the US budget? I'll take US spending for 500, Alex! That's right, monster-claw person, you guessed it. Back in Fiscal Year 2016 the biggest single expenditure in the US budget was Social Security! And how much did we spend on social security? Drum roll please. Yep, you got it: One thousand three hundred and sixty nine billion dollars. Wow. 1,369,100,000,000 Washingtons! Boom! That's a lot of pizza! See that dark blue part there in the circle below. That represents US spending on Social Security just in 2016. That’s roughly 33% of the total budget! 33 is a special number. It’s about ⅓; it’s the age I’ve been for the past 16 years; it’s also the amount of revolutions per minute for an LP; and it’s the age when the following celebrities died: John Belushi, Sam Cooke, Alexander the Great - but not so great at getting old, The Rapper Big Moe, Jesus Christ, and Baseball legend Darryl Kyle. Oh, and Justin Bieber - he just hasn’t gotten there yet. Ouch! Wait a second, you might say. 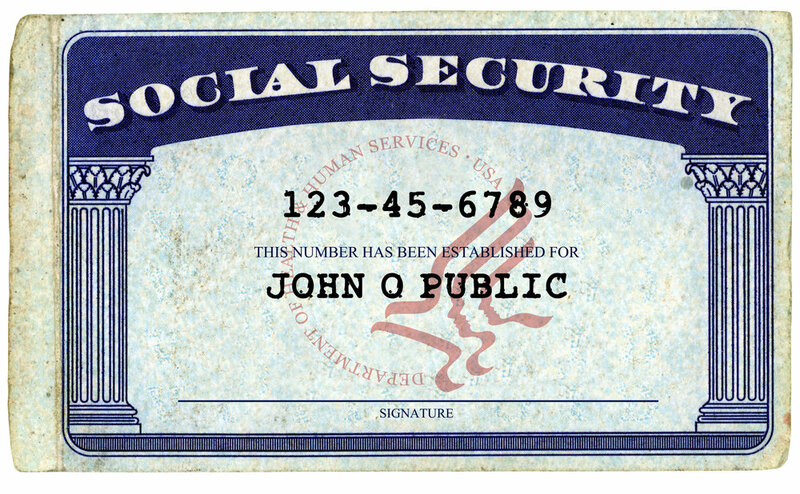 Just what on earth is this social security thing we’re spending so much money on? Social Security is the foundation of economic security for millions of Americans—retirees, disabled persons, and families of retired, disabled or deceased workers. About 163 million Americans pay Social Security taxes and 59 million collect monthly benefits. Oh, and that's not a real card so don't go and print it out! So just to make sure we are all on the same page. Put your piece of paper with the circle on your desk. Now put all your pennies back in the circle. Then take out pennies until the number of pennies that remain equals, as a percent of the total budget, what we spend on social security. Hello dates!!!! Now. wipe the pennies clean! Okay. Now that you’ve got the hang of it, let’s try this again. 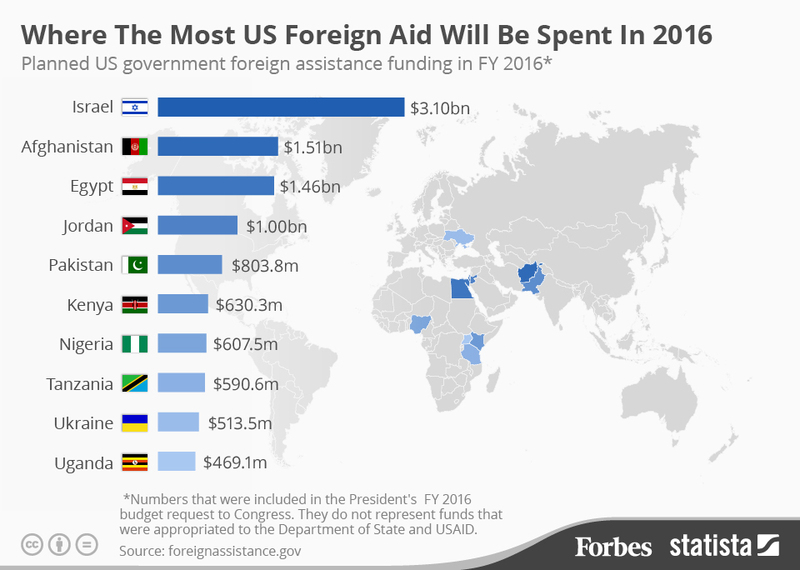 This time we’ll consider how much the US spends on Foreign Aid! Funny, I just happen to know. Foreign aid is assistance we give other countries. Foreign aid is money that one country voluntarily transfers to another, which can take the form of a gift, a grant or a loan. We tend to give foreign aid to poor countries or countries in crisis. Rich countries like Switzerland and Japan don’t need a whole lot of foreign aid. You don’t go around giving Dollar Store gift certificates to Millionaires, and the U.S. doesn’t give a whole lot of foreign aid to rich countries. 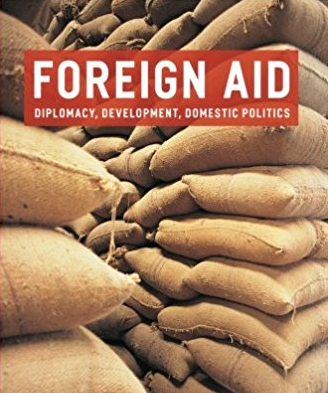 In the United States, foreign aid usually refers only to economic assistance and military assistance the federal government gives to other governments. Economic assistance includes all programs with development or humanitarian objectives. That tends to include projects related to health, disaster relief, the promotion of civil society, agriculture and the like. Most economic aid dollars come from the State Department budget, including spending allocated by USAID. 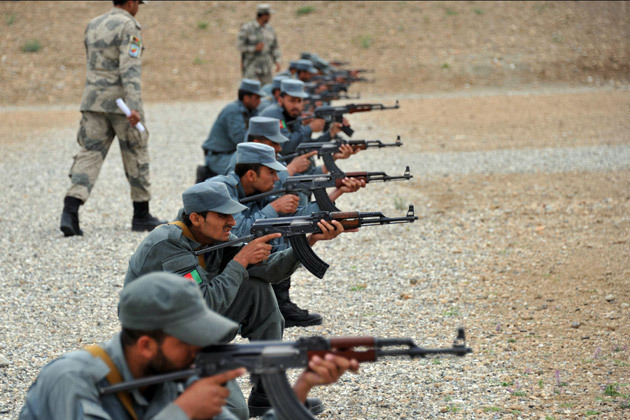 Military aid includes military financing, which our allies use to buy weapons, funding intended to advance counterterrorism and anti-narcotics initiatives, and money spent on efforts related to military operations in Iraq, Afghanistan and other nations. Most military aid dollars come from either the State Department’s or the Pentagon’s budget. Here’s a list of the top destinations of US foreign aid. In the circle on your paper, place the number of pennies out of our total budget that you think the average American thinks we spend on foreign aid. Did you get that? Not the amount you think we spend, but the amount you think most Americans think the US spends on foreign aid. That's complicated but you can do it! Write the words “Predicted US Foreign Aid” on a sticky note and place it at the top of the paper. Take a selfie of all that #fakenews Hello viral celebrity! Okay. Let’s compare your fake guesses to the actual answers. 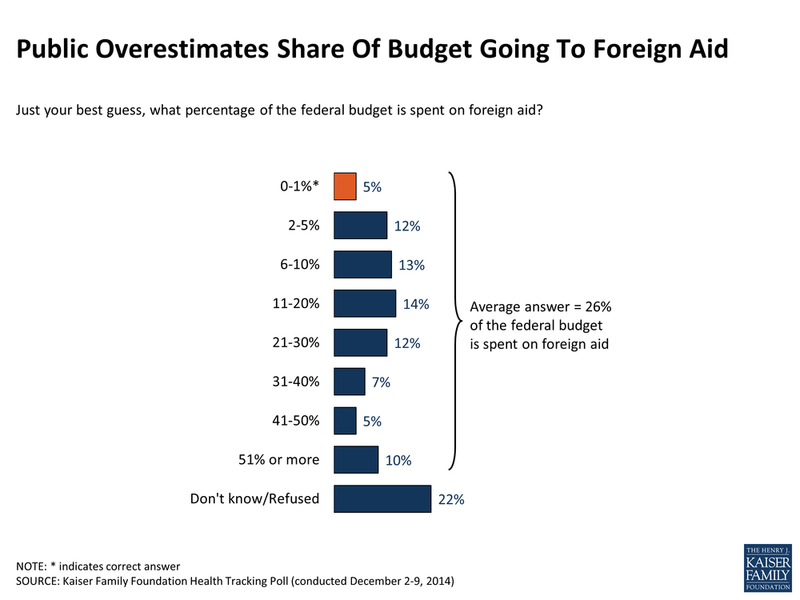 Here’s how much Americans imagined we spent on foreign aid. According to an NPR report from 2015, the average respondent estimated that 26 percent went toward assisting other countries. If you put 26 pennies on the circle...Bravo - that's precisely the number the average American thinks we spend on foreign aid. And check this out - 10% of Americans think we spent over half!!!!!!! Yes over half of all our federal budget on foreign aid. Wow! That's like guessing that the average high school senior spends 90% of their time on homework. Now. clear those pennies off the paper and get ready to rumble. Let's try this another way. Put the number of pennies on the circle that you believe represents the actual percent of the US budget that we spend on foreign aid. Get ready. Get Set. Lose! This is from 2014 so the numbers are a little different from 201 but you get the idea. That's right, the actual number is less than 1 penny! That’s right - less than 1%! Is there anything less than a penny? Can you get out a little saw and cut off about a bit of that penny? Stop. Before you post this. Pro Tip - The internet remembers everything! Now isn’t that interesting how far off reality can be from perception. If you were one of those people who guessed less than 1% you were right! And now here’s another round chart that shows what happens when people learn about how much the US actually spends on foreign aid. And I’d like you to be honest, just this once, and think about how your opinion of our foreign aid spending has changed based on what you now know. Let’s take that survey again. Don’t know/Refuse to Answer/You talkin’ to me? After they see the reality of foreign aid spending, the number of people who say we spend too much is cut in half. Meanwhile, the number of people who say we spend too little is more than doubled. So this raises a number of interesting questions. Please answer them. How much of your opinion about the world is based on facts, data, and reality and how much is based on hunches, guesses, and opinions? How democratic is our system if the people voting don’t know what we are doing and don’t support what we are doing when they find it out? Who is making these decisions about foreign aid spending? In what other areas are American policies this different from American opinion? What would happen if all Americans knew this information about foreign aid? Just what is this foreign aid for anyway? And who gets it? How has your opinion on foreign aid changed today? Before landing. You might be curious how US foreign aid compares to other countries. What portion of our GDP (that’s the total amount of money our country makes each year) do we give in foreign aid? Here’s how our foreign aid as a percentage of our GDP (a country’s annual income) compares globally. In other words, if all our money for the entire year equals $100. We keep $99.87 and give the rest to the poor. Wow, that's generous! Think about how different people would feel about the issue of foreign aid and complete our foreign aid points of view sheet. Now before we are done let's get in teams of 4 and complete this Foreign Aid Simulation! Before you form your opinion, check out what these heavy hitters from the left and the right have to say about foreign aid. Read all three opinions and share which you think is the most compelling argument and why. Or have teams read one argument and share its central opinion. Hey, y'all! This would be a great time for a fishbowl about Foreign Aid! Now let’s end our investigation and synthesize all we've learned by writing! Let’s start by writing. And here’s a pro-tip, not everyone actually agrees with you. Your job is to convince other people of the validity of your argument. Start by convincing yourself and then scale up. Here’s the question you’ll be arguing about. Should the U.S. increase its foreign aid? One more thing. Knowledge is only as good as what you do with it! Remember what you just wrote about foreign aid? Try to convince someone who can actually do something about this that your opinion about foreign aid is correct. Try sharing your thoughts with the President or Congress or the Secretary of State. You could also try to convince the general public and get them to convince their representative. Or you could form an interest group. It doesn’t matter what you do as much as that you do something. Remember, our foreign aid got where it is because people argued about it and someone won. Why not take a try at winning? Ready Set Go! When you’re done, share the result of your action with class. Now that you’ve learned about and acted on this issue, share your opinion - retake our foreign aid survey. How did your opinion change? In what way did your opinion not change? What do you know now that you didn’t know before. I hope you’ve enjoyed playing with us. If you like this presentation please share it! And just think, if you share it enough it might just change foreign aid spending. Thanks for joining us, now please sit back, relax, and enjoy your flight! We’ll see you next time! If you dug our Foreign Aid Lesson you'll love our policy unit!